I recently had the pleasure of attending a futebol match between our “local” team, Kabuscorp, and 1º de Agosto, one of the dominant forces in Angola’s premiere league. While the quality of the futebol was questionable (even to the untrained eye) the afternoon was incredibly entertaining. First, a little background: We live in the Bairro Popular which is in Kilamba Kiaxi (which is in Luanda) – our neighborhood area appears in the lower left hand corner of this map (for reference, Ingombota contains the bulk of the central city). The bairro next to ours, just off the map to the lower left, is Palanca. Palanca is known as a war destination for Angolans from the northern province of Zaire and a large immigrant community from the Democratic Republic of the Congo. Portions of the DRC and Zaire province were formerly part of the Kindgom of Kongo which had its capital in Mbanza Kongo (the current-day capital of Zaire province) and the size of the Kongo community in Palanca is large enough that Palanca is sometimes jokingly referred to as "República Democrática do Palanca." Futebol fans in Palanca are quickly becoming known for their rabid support for the team of their local “Kabuscorp Sport Clube Palanca” which was elevated to the top tier of professional teams this year. As a recently promoted team, Kabuscorp is more or less expected to occupy the bottom of the rankings. This doesn’t appear to put much of a damper, however, on the enthusiasm displayed by their supporters. Three weeks ago underdog Kabuscorp triumphed on the road against Benfica do Lubango, a victory which has been credited, at least locally, to the turn out and volume of their fan base. At the match I attended, cheering for Kabuscorp began a full two hours before play and continued unabated until the 86th minute when 1º de Agosto scored the game’s only, winning goal. Highlights from the shenanigans included crowd leaders in full body paint, a sizable brass band with incredible volume and endurance, a fire breather or two (of which the police did not approve), taunts at spectators in the building behind us including warnings that their building was going to fall (no small joke in Luanda these days), and special new cheer citing the presence of Kabuscorp’s white fans as evidence of its impending victory. The cheers and songs throughout were in Lingala but a friend of Arthur and Jojanneke from work was able to translate for us. He was initially nervous about doing so as the cheers pretty vicious in their treatment of the other team and their fans, but once Arthur relayed the content of some common Dutch futebol songs our informant was comfortable sharing the gist of their taunts with us. While normally I’d be dubious of the ability for cheering to have a large impact on the game, it seemed best not to discount the importance of the Kabuscorp support crew. I’ve never seen a team interact with a crowd as much as this one. One of the assistant coaches even came over to the stands before the game to confer with the crowd ring-leaders. Some of the loudest cheering of the game came when the head coach made his tour of the field and tipped his hat to the crowd. While he was on the field everyone in the stands made sure we realized who he was and told how him important he was – he was described to me as "chefe" (a common word here translating more-or-less to boss or chief) as well as king and hero in English. Indeed, despite terrible play by the goalie and despite 1º de Agosto being bigger, stronger, faster, and more talented at every position Kabuscorp managed to keep it tied 0-0 until the very end of the match. Even if our attendance at the match didn't culminate in Kabuscorp victory, the fallout from our presence continues to be felt -- as recently as this weekend I was stopped in the street and asked about my support for Kabuscorp. I've also heard rumors that were clips of us on the television during the local sports coverage. The only problem with all of this is that Kabuscorp isn’t considered by everyone to be a "real" Angolan team, as many of the players have (apparently) naturalized from the DRC. There’s also the small problem that I now live on the other side of the bairro from Palanca and all of my new neighbors are 1º de Agosto supporters. 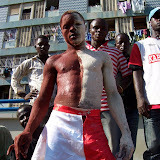 I do, however, appreciate that Kabuscorp is a huge underdog and cheering in Lingala is a heck of a lot of fun -- even if I don't know what I'm yelling. I’ll have to hear out my neighbors on the case for 1º de Agosto and I’ll report back with my fan status in a few weeks. bumped into your blog, and liking it! I live in Luanda too but I don't have the luxury in time to be able to post such descriptive postings as yours. I put your blog in my bloglines so i can keep up with your stories. Hi, Nadia -- Thanks for the visit! I do try to make my posts substantial, but you'll notice that they don't happen very often! I'll check out your blog and, who knows, maybe we'll run into each other 'round town!